In the February editorial, I wrote that 2015 must be the year of citizenship, since we see how we Hispanics are often unfortunately displaced from the important discussions that affect us directly, because we are not generally involved in civic or political life. We know that the Hispanic vote was decisive to give victory to Barack Obama in the last presidential election. We also know that in last year's elections, districts that were at stake did not have a high population of Hispanic voters, and now the majority of the winners’ speeches are anti-immigration and pro-deportation. Thus, this 2015 is a perfect year for those who are eligible to become citizens (almost nine million throughout the country) to start preparing, and for those who can already vote, to do so. Get informed and act are the watchwords for everyone. Perhaps you've heard that several politicians are getting ready to begin their campaigns for the 2016 presidential election. Ted Cruz, Republican Senator from Texas, recently announced his intention to be part of the presidential race. Yes, the lawyer Cruz, a Harvard graduate, is Hispanic (Cuban father), but that's all. Amancio Salazar, leader of the group Hermanos Unidos from Newburgh, NY, and a person aware of the importance of Hispanic civic participation in the Hudson Valley, says: "regardless of whether Cruz is of Hispanic origin, we cannot be so sure that he will advocate for the millions of immigrants. We need to understand his proposals and in these elections we really need to go out and vote, we need to unite and demand that campaign promises are fulfilled. In these elections, the Latinos who will vote have the great responsibility to choose very carefully, to only support the candidate who will be fair with our immigrant brothers. We also need to remember the important areas of finance, health and education. Our vote counts more than ever, so be careful!". My opinion: I totally agree with Salazar. A Hispanic name does not say much, what speaks strongly are actions. Was the candidate consistent or did they flip like a pancake at the first opportunity in their political actions? Did the candidate vote for or against measures that affect us? What did the candidate say and what did the candidate do about immigration, health and education? In short, this is about being informed about each of the candidates, so nobody takes us off guard, it is about mutually educating ourselves and to be able to assert our voice and our vote. And speaking of the vote. As promised, starting this month the educational supplement of La Voz presents some questions from the citizenship test, along with a list of useful vocabulary, so that people will lose their fear and feel encouraged to take this important step in the realization of their American dream. This dream, in this month’s La Voz, also has to do with bilingual education and the legacy that we will leave to our children. My parents always insisted in saying: "We only leave education to our children as our legacy." And, indeed, their spending in my education has been a great investment, for which I am very, very grateful. In this country, the land of opportunities, we know that education is an excellent path to a more prosperous future, but we also know that this key can be quite expensive. Is there anything we can do so that it does not cost so much? Yes, for example, we can devote time to teach to our children to not only know how to speak some Spanish, but also to read and write it ―reading La Voz as a family might be one way of achieving this. Being bilingual at an early age, when the brain is a true sponge, absorbing everything that we expose it to, is one of the best gifts we can give our children. Haven't you seen how expensive it is to pay for language courses today? Or the number of job offers that include the phrase that preference is given to people who are both fluent in English and Spanish? 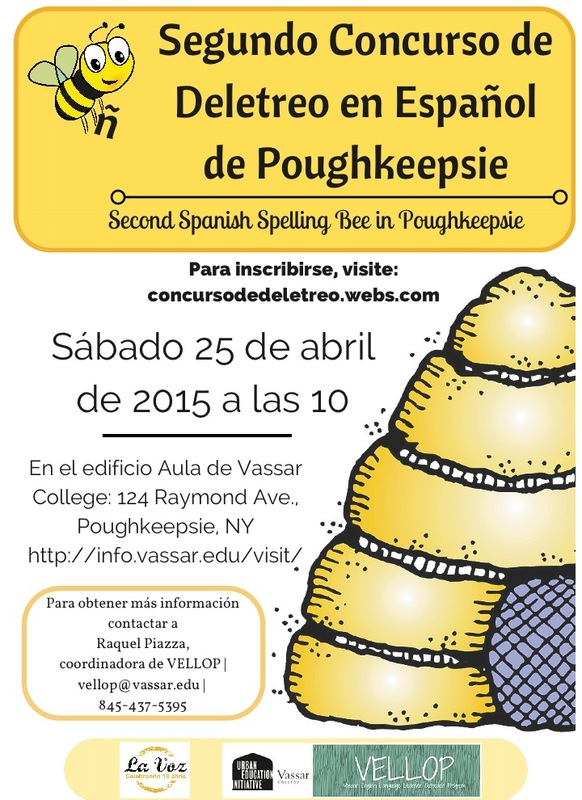 The Second Spanish Spelling Bee, organized by La Voz and VELLOP of Vassar College is our small contribution so that new generations of Hispanics in the United States can feel proud to be able to communicate and understand several worlds, whether in the language of Cervantes or of Shakespeare.